The only things those people have that you don’t is guts. Do you wanna live forever? The Marine Raiders were established to operate behind enemy lines during World War II. They specialized in amphibious warfare in the cover of darkness. The Raider concept was born in the early days of World War II when America was perilously weak and needed forces that could harass and slow down a stronger enemy. The President wanted an American version of the British Commandos and recognized a need for what would become the Raiders. The Marine Corps was the natural place for this organization. The Raiders were given the best of the Marines’ equipment, and were handpicked from available volunteers. From the beginning Marine recruits are isolated from all civilian influence during the lengthy 13 week boot camp instilling in them that they have entered a closed off and exclusive society. From the time of the Spartans, isolating a soldier from society and making him believe that he suffers more is a valuable tool. Adding a lack of reward and increased expectations compared to ordinary men creates a powerful bonding experience. The harsh training and constant reminder that ‘you volunteered for this‘ instilled an intense desire to endure the worst and to achieve the impossible just to prove it can be done. While most Marines have enlisted out of patriotism, loyalty soon took on an entirely different meaning – a brotherhood was formed. The men of the 1st Raider Battalion and future battalions created later in the war were products of this loyalty and brotherhood. Their bond was knowing that they were the elite of the elite, and that they have suffered and endured more than should be expected of a war fighter. Training focused on increasing proficiency with weapons, and improving land navigation and map analysis. Much of the training was conducted with an emphasis on night combat. Hiking with full field gear started slowly and worked up to two-day 70 mile hikes. Great emphasis was also placed on physical fitness. In addition to the increased weapons training and hikes, the leaders also placed more than usual emphasis on knife fighting. 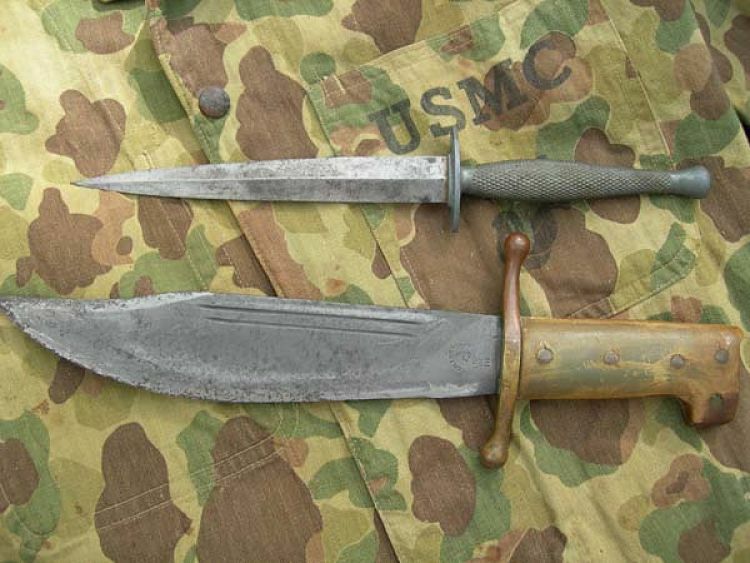 Raiders were issued and carried two distinct knives; a larger classic Bowie style knife with a 9″ blade for field craft tasks and a Raider Stiletto patterned after the British Commandos. The stiletto knife was the definitive Raider weapon and was strictly a close-quarters stabbing weapon. The Marines had a long standing connection with legendary W.E. Fairbairn and E.F. Sykes who designed the knife. Both men taught the Marines the deadly art of knife fighting. New footwear for the Raiders included jungle shoes with flat bottoms patterned after gym shoes, made of green canvas with a black rubber sole. The rubber extended up and over the front to provide protection for the toes – much like what you see on modern day Merrell or Salomon shoes worn by SOF units. Some of the Marine Raiders opted to wear the brown rough suede ‘boondocker’ low-top boots. Laced leggings were worn over the boots with the trouser tucked inside the boot. They used an Army designed ruck in flat or camouflage patterns. The design was much more simple and practical than the older standard issue packs. These packs were only issued to the Raider and Parachute Battalions. The Raiders also saw the introduction of specialized jungle uniforms. The two piece uniform was an Army camouflage with reversible green and brown dominated sides made from Herringbone Twill – HBT – which was much more tear resistant. Some Raiders produced improvised camouflage patterns on the uniform by painting in spots or just by using mud smeared across on different regions. With the new improvised uniform came a reversible cloth helmet cover. Marines often left the rear flaps of the cover hanging to provide protection from the sun and bugs, and to help break up the outline of the head and neck. Web belts, ammunition pouches, and other 782 gear were manufactured in a light tan color. The bolt action M1903 rifle with bayonet was the standard Raider weapon. The standard squad automatic weapon was the M1918 Browning Automatic Rifle (BAR). The Raiders also acquired Johnson M1941 light machine guns. The heaviest weapons commonly found in the Raider Battalions were various models of Browning .30-cal. light machine guns and 60mm mortars. The Raiders arsenal did not necessarily include the Thompson submachine gun, but many found their way into Raider hands. Though hard to fire at times, the Thompson was popular for its reliability and stopping power. Other specialized gear included lightweight jungle hammocks with mosquito netting, camouflage poncho, shelter halves, and improvised ‘jungle’ first aid kits. On patrol, the men slogged through wet vegetation and swamps, constantly crossing streams numerous times a day. When night fell upon them there was little inclination to pitch tents using two shelter halves. The men would simply lay on the ground and wrap themselves in a shelter half or poncho. The Marines did the best they could with what they had and they were very successful at it. By late 1943 the Marine Corps made it clear there was no longer a role for the Raiders. The changing nature of the war in the Pacific, with many large-scale amphibious assaults to come against well-defended islands, negated the requirements for small light units that could strike deep into enemy territory. 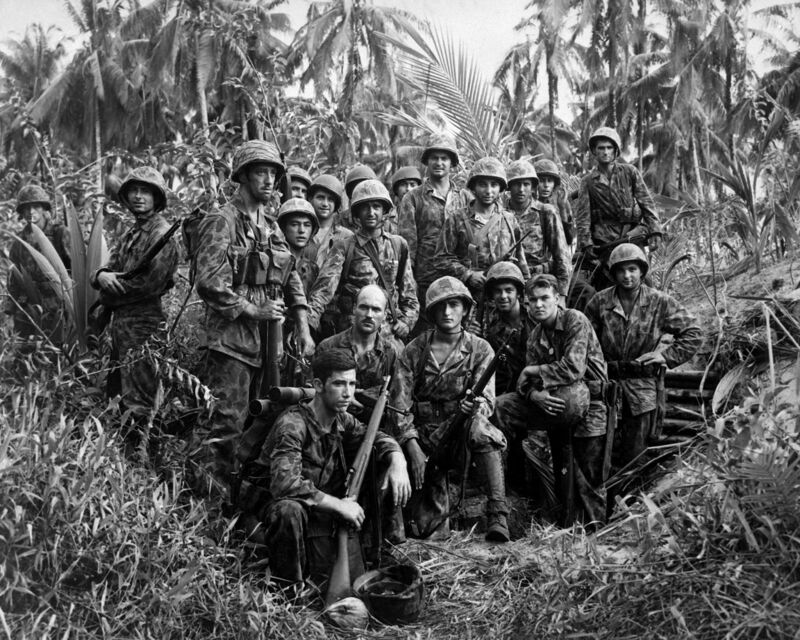 the Marine Raiders were dissolved in February 1944 and re-designated the 4th Marines – the start of its conversion into a regular Marine infantry regiment. After years of debate, the Marine Corps Special Operations Command – MARSOC – recently made a major change, adopting the name of the combat-hardened Raider units that fought in the fierce Pacific island-hopping campaign of World War II. Much like the Raiders units, which were created at a time of crisis. MARSOC was established in 2003 as the demand for special operations skyrocketed during the post-9/11 conflicts. United States Marines take great pride in their irregular warfare heritage. From this point forward, the Marines of MARSOC will be officially aligned with the Marine Raiders of World War II and are charged with maintaining the high standards and traditions that accompany such distinction. Step into the arena of the modern-day Marine Raiders.